Blinded by smallpox at eighteen, 17th century harpist Turlough O’Carolan, is now one of Ireland’s musical icons. 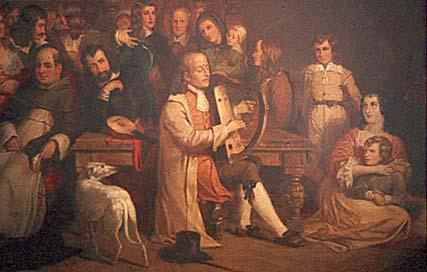 His music straddles Baroque styles and folk tunes, uniquely preserved due to the popularity of his melodic compositions and the physical notation of his work at an important harpist’s convention at Belfast in 1792. Dorset’s Colin Thompson presents a newly dramatised musical show about O’Carolan. Thompson won a music competition at the Royal Festival Hall aged just sixteen, and went on to study guitar and violin in London. As a member of the English Guitar Quartet for six years, he developed an interest in early and traditional music, which has since led to projects such as ‘Benjamin’s Book’ with folk singer Tim Laycock and membership of the New Scorpion Band. Colin is ably supported in this, his latest show, by harpist Florence Astley, who studied at the Royal College of Music, and talented local actor Barry Irwin. This show celebrates O’Carolan’s achievements at the time, and transports him to the present day to reflect on some of the many different interpretations of his music that have since occurred. Join Turlough O’Carolan, and his brilliant two musical interpreters on harp and violin, as he confronts some of the peculiarities of the 21st century!